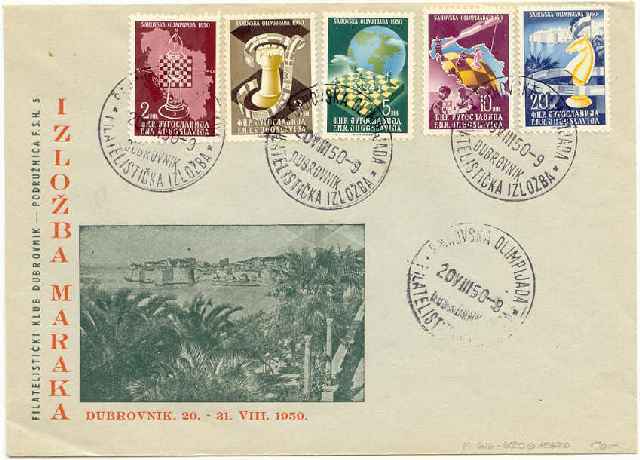 This colorful first day cover was prepared by Stamp Club of Dubrovnik. international chess matches held in Dubrovnik on August 20-21.
include words like Chess Olympids and Philatelic First Day. Help on translation would be appreciated. The cover has a small photo of the Dubrovnik harbor as part of the cachet. The complete set of multicolored stamps are Scott 300-304. Dubrovnik is a on the Adriatic coast in what is now Croatia about 150 km south of Sarajevo. Dubrovnik has been a tourist destination for years.